In 2013, Isabelle Bacher made the decision to move from Austria to the Arctic because of the opportunity to get closer to the magnificent nature and to live her passion, landscape photography. She is a professional architect by trade. 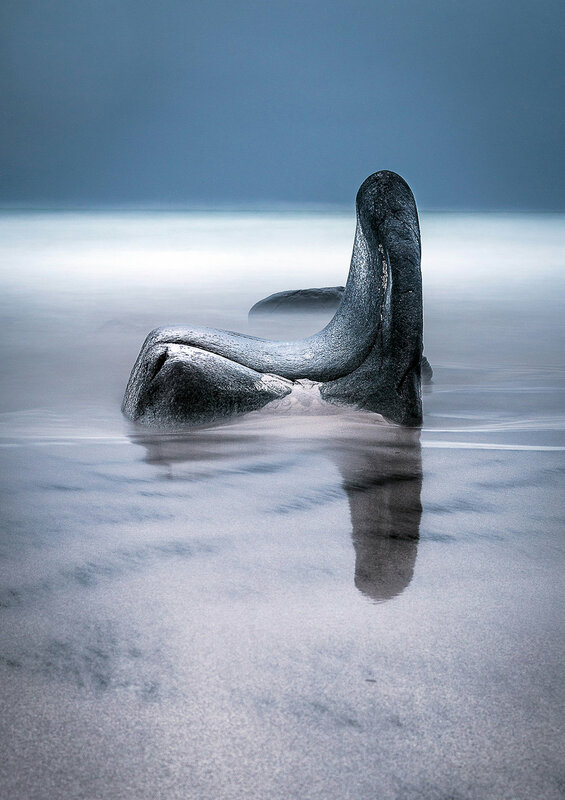 Isabelle has exhibited her photographs in Norway, Austria, the UK and France, and has been awarded in international competitions, including first place in the 2018 Sony World Photography Awards Austrian National Award. I am Austrian with Norwegian roots but my heart beats north of the polar circle. I decided in 2013 to settle in Northern Norway for a four year period. My job as an architect allows me to be geographically flexible and to live my passion for landscape photography. The immensity of the lonely fjords, the aesthetic glaciers, the majestic mountains and the breathtaking light of the Far North are my passion. It fascinates me to visualize the architecture and forms that nature has created from the Ice Age to our time. The intent of my work is to show the amazing, beautiful and powerful forces that have created the magnificent nature of the Arctic. Light is the main subject. I love the abstract and intimate views of the natural world. Why photography? Do you remember when you first discovered the medium? Through my father, I discovered the medium of photography. I started taking analog photographs at the age of 12... and loved and still love the experience in the darkroom. I became serious about photography when I got my first digital camera in 2000 from my father when I started studying architecture. Since then, photography has always been present in my life. I love the process of taking landscape photographs... staying in the area of a spectacular landscape, seascape, mountain, rock; finding the right spot and angle and waiting for the magical arctic light or for northern lights. I love to take architecture photographs, making a clean composition, playing with lines, symmetries, patterns and reflections and to make my focus at the geometry and surface. And I love taking portraits. Photography is my passion. During all seasons of the year, between the midnight sun and the icy polar nights, I visited the sandy beach Bleik, with a view on the island of Bleikøya in Vesterålen, Norway. The small island, the lonely sandy beach and the surrounding nature with its bizarre rock formations and mountains fascinates me. In February 2017, in a starry, unforgettable full moon night during the dark season, the Northern Lights danced for several hours over the mountains and from midnight over the small island. It was a magical experience. The challenge in the Arctic is the cold weather throughout the year round. Snowstorms with whiteouts, heavy wind and storms, darkness most of the day and nighttime, frozen roads and much more can make photography quite difficult. You really need the right equipment and clothing to photograph in the Arctic – but it offers unsurpassed beauty in return. I like to show my work and to surround myself with an environment that inspires me. I hope to make photography an even bigger part of my everyday life. What top tips do you have for shooting in Arctic conditions? Venturing into the Arctic to photograph landscapes really requires some thought and preparation. In winter, temperatures can drop well below minus-30-degrees Celsius, which can very quickly become life-threatening. It’s very important to be dressed appropriately and to be prepared for bad weather. I always use a Vaseline to protect my face and skin. If you are in icy areas, use ice spikes under your shoes and your tripod. Pack extra batteries. It’s a good idea to keep one battery in your camera, a spare keeping warm tucked in an inner pocket, and the third charging in camp. Or use an analog camera with film. Being properly prepared is the key to being able to make great photographs in extreme conditions and for me, photo opportunities like in the Arctic found nowhere else on our planet. Where in the world are you and what's next for you? Actually now I am in Innsbruck, Austria. These are exciting times for me, photography is my passion and I try to live it. Through the Sony National Award this year, I got some interesting and fantastic possibilities and connections. I am not really sure about whats next to me but I am really excited to see where my photography work will take me.